The Pope dismissed the term "emotional ties" for what is happening among young men and girls from different religions, cited as the apparent cause of conversions by the Salafists. In an interview with Al Ahram Daily he said it is "sentimental coercion of girls who have not reached adulthood." The Pope said it is now common among Coptic families not to send their daughters to school because of fear kidnapping and forced conversion. Anba Pakhomios, the bishop of Mersa Matrouk, said Coptic families are increasingly choosing not to send their girls to public schools, making them study at home and only go to school during the examinations. The Muslims accused the Coptic Church of causing sedition, because they claim Sarah left home, embraced Islam and married a Muslim of her own free will. They have denied that she is a minor. "When they talk of adulthood, it is not adulthood in the legal sense (18 years old)," says Dr. Naguib Gabriel, head of the Egyptian Union of Human Rights Organization, "but according to their concept that a girl reaches adulthood when she starts menstruating." 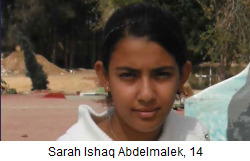 The Coptic Church and several rights organizations, including the Egyptian National Council for Women, categorically regard Sarah as a minor and insist on upholding the law and the United Nations Convention on the Rights of the Child (CRC), ratified by Egypt, including the Minimum Age Convention, which clearly declares anyone below the age of 18 as a minor. Dr. Ahmed Rifaat, a law professor at Beni Suef University confirmed that Sarah is a minor in the eyes of the law, hence she may not copulate nor marry until she reaches the age of 18 and any talk about her marriage or change of her religion is completely against the law; her marriage is considered void and she must get divorced . Also the authorized Islamic marriage registrar (mazoun) and her husband bear full responsibility as they knew she was a minor. Al-Azhar also stipulates a minimum age of 18 years for changing one's religion to Islam. Reverend Bigemi Anba Paula, from the Mersa Matrouh dioceses, where Sarah attended church, replied to the Salafist accusations that the church is meddling, saying "If the State did its work, the church would not have been pushed into the problem. We reported the case to the director of security, central security, military security, minister of interior, heads of Bedouin tribes and NGOs. We also hand delivered a complaint to President Morsy on October 18 during his visit to Mersa Matrouh. The prosecutor in Alexandria ordered the arrest of the Muslim husband, but no action was taken by the police." He accused the authorities of siding with the Salafists, "all the time security knew where Sarah was, I wonder whether security are afraid of a confrontation with the Salafists?"